Since its first endeavor into the world of optical products in 1917, Nikon’s affinity for binocular innovation has delivered myriad sensational and extraordinary views to the eyes of the world. Now, with a full century of experience to draw from, Nikon raises the critical eyes of optics aficionados to a level thought unachievable. Introducing Nikon WX. More than a lesson in optical achievement, WX speaks volumes towards catapulting its user into the frontier of incredible sharpness throughout a seemingly endless viewing periphery. Not only will this super-wide field of view seemingly transport an entire constellation of crystal-clear imagery to the eyes of the beholder, but do so with the amazing realism that has become Nikon’s hallmark for 100 years. The 100th anniversary models bear the commemorative logo. High-quality multilayer coating, providing uniformly high light transmittance across the entire visible range, is applied to all lenses and prisms to realize a more natural, clearer view. The colours of stars in the night sky are reproduced with fidelity. ED glass elements employed in each tube compensate for chromatic aberration that causes colour fringing at the very edge of the field of view. Multiple ED Glass elements result in a contrast-rich and high-resolution image. All lenses and prisms are free of lead and arsenic, under the Nikon Green Procurement Standards. Comes with an exclusive tripod adapter TRA-4. 1/4-in. (ISO1222) tripod screw enables attaching to a tripod. 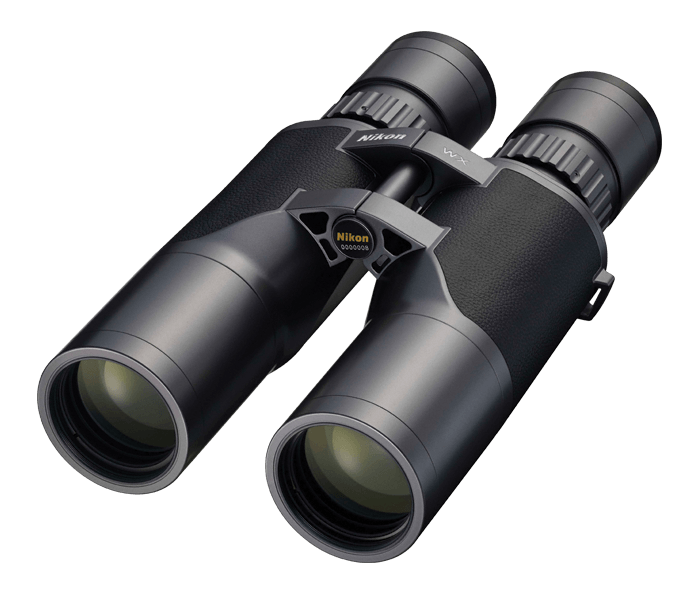 WX binocular’s exclusive case is supplied for storing the binocular and accessories.